Andres Korn Wins Event 56! 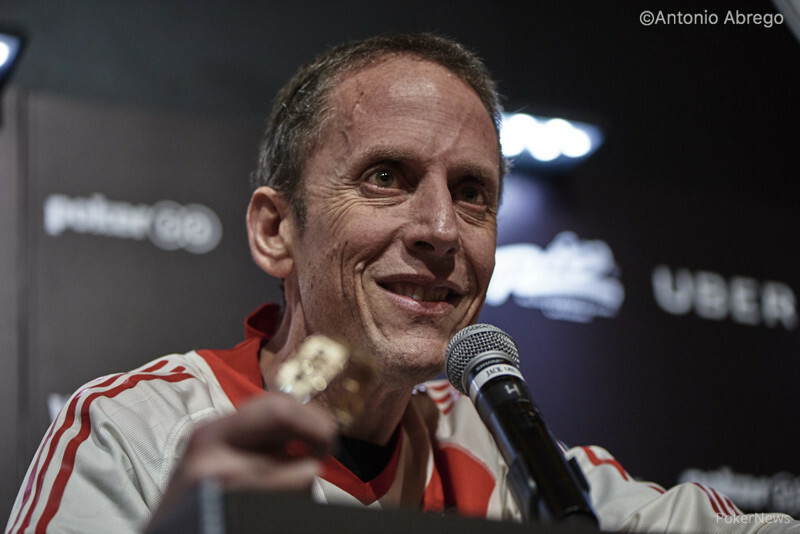 Andres Korn just became the second-ever WSOP bracelet winner from Argentina, the first being Ivan Luca in 2015. Korn beat out a field of 623 players to win Event #56: $5,000 No-Limit Hold’em for $618,285 and the elusive gold bracelet. Korn nearly doubled his recorded career tournament earnings with this score, and it was around six times the payday of his previous biggest cash to date. But for Korn, the win was less about the money. Korn came into the final table with the chip lead, and he immediately went to work. The first four eliminations came in the first level of play, and Korn was responsible for the first two — Sergio Cabrera in ninth place, and Mark Zullo in eighth place. In both hands, Korn called to put his opponent at risk with a pocket pair against two overcards and held up, improving to a set on the flop with pocket eights against Zullo. 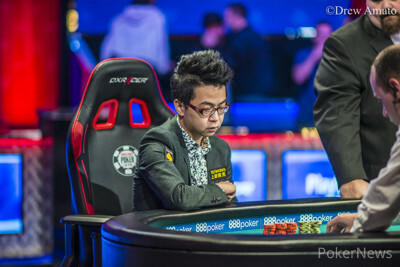 Pete Chen knocked out the next two players to gain some ground on Korn, and they were down to five players before the second level of the day. In the next level, Korn eliminated Mike Sowers in fifth place and Marton Czuczor in fourth place to take a commanding lead into three-handed play. Against Sowers, Korn spiked a jack with queen-jack to beat ace-nine suited, and he flopped another set with pocket eights against Czuczor’s ace-jack suited to send him to the rail. Korn dominated three-handed play, maintaining a 2:1 chip lead over the next-biggest stack throughout. After he eliminated Thomas Boivin in third place by winning yet another flip with queen-seven against Boivin’s pocket fives, Korn entered heads-up play against Chen with a chip lead of more than 2:1. Korn ran good at the final table, as he explained: “It was beautiful. I connected with every flop. I won every flip. The cards just kept coming my way. It was amazing.” Korn said he felt good going into heads-up, as he has a lot of experience playing heads-up online, and then he just kept connecting with the flop. In heads-up play, Korn kept the pressure on Chen, grinding him down slowly. Chen doubled up once after getting short-stacked, but Korn got him back down to around 1,000,000 chips soon after. In the final hand of the match, Korn shoved on the button with eight-nine suited, and Chen called with king-nine. Chen was in good shape to double up again, but Korn once again out-flopped his opponent (with top two pair this time), then held on to eliminate Chen in second place and win the tournament. If Korn’s favorite hand wasn’t pocket eights before, it just may be now. Korn flopped two sets with eights to eliminate two players at the final table, then paired his eight in the last hand for his first win in the States. With two WSOP Main Event cashes to his credit, Korn hopes for his good run to continue into the most prestigious event in poker, which begins next week. Andres Korn Wins Event #56! Hand #138: Andres Korn open-jammed, and Pete Chen called, putting himself at risk. Chen was in great position to double up until the flop came . Korn flopped two pair and took the lead. The on the turn gave Chen some chop outs, but it was not to be as the completed the board. 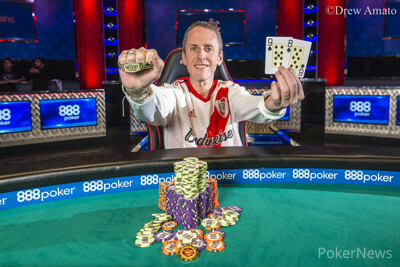 Andres Korn became the latest WSOP champion. Chen received $382,122 for his runner-up finish, while Korn banked an impressive $618,285 for the victory. Hand #133: Pete Chen gave Andres Korn a walk. Hand #134: Korn limped, and Chen moved all in. Korn folded. Hand #135: Korn got a walk. Hand #136: Korn open-jammed, and Chen folded. Hand #137: Chen open-jammed and took the pot. Hand #128: Andres Korn completed on the button, and Pete Chen checked his option. The flop was . Chen checked, Korn bet 130,000, and Chen folded. Hand #129: Chen raised to 240,000 on the button, and Korn called. The flop was , and both players checked. On the turn, Korn bet 160,000, and Chen called. The river was the , and Korn bet 160,000. Chen called and tabled the best hand to win the pot. Hand #130: Korn raised to 250,000 on the button, and Chen folded. Hand #131: Chen raised to 240,000, and Korn called. The flop came , and Korn checked. Chen bet 250,000, and Korn check-raised to 685,000. Chen confirmed the raise amount and called. The turn was the , and Korn moved all in. Chen double-checked his hole cards and folded. Hand #132: Korn moved all in on the button, and Chen folded. Hand #123: Pete Chen opened to 250,000, and Andres Korn defended, bringing a flop of . Korn checked, and Chen continued for 150,000. Korn called. The turn was the , and Korn checked once again. Chen checked, as well, and the was delivered on the river for free. Korn bet 150,000, and Chen folded. Hand #124: Korn limped, and Chen checked to see a flop. Chen checked, and Korn bet 130,000, winning the pot. Hand #125: Chen opened to 250,000, Korn three-bet to 645,000, and Chen folded. Hand #126: Chen got a walk. Hand #127: Korn got a walk. The two finalists have completed their fourth level of the day and have been rewarded with a 15-minute break. Hand #116: Andres Korn raised to 200,000 on the button, and Pete Chen made it 600,000 from the big blind. Korn called, and the flop was . Chen checked, Korn bet 575,000, and Chen folded. Hand #117: Chen completed on the button, and Korn checked his option. The flop came , and Korn check-called a bet of 125,000 from Chen. On the turn, both players checked, and the river was the . Korn bet 165,000, and Chen called. Korn showed an eight for two pair, eights and deuces, good for the pot. Hand #118: Korn completed, and Chen checked. The flop was , and Chen check-called a bet of 140,000 from Korn. The turn was the , and both players checked. On the river, both players checked again. Neither player had a spade in their hand, so both were playing the board for a chopped pot. Hand #119: Chen completed on the button, and Korn checked. The flop came , and Korn checked-called a bet of 100,000 from Chen. They both checked the turn, and on the river, Korn bet 385,000. Chen folded, and Korn took down the pot. Hand #120: Korn raised to 200,000 on the button, and Chen folded. Hand #121: Chen completed on the button, and Korn raised to 365,000 in the big blind. Chen called, and they saw a flop of . Korn bet 525,000, and Chen called. The turn was the , and Korn bet 790,000. Chen folded and asked Korn to show the bluff. Korn showed the before raking in the pot. Hand #122: Korn completed on the button, and Chen raised to 400,000 in the big blind. Korn quickly folded, and Chen won the pot. Nine Players Remain; Who Takes Home the Gold?